Puracyn® Plus Professional Formula Family Of Products - PuracynPlus Professional Formula A next-generation solution for optimal wound bed preparation. The Puracyn® Plus Professional Formula Family of Products is a synergistic wound care management system based on an innovative and powerful science that provides a new strategy for wound care protocols. Puracyn Plus Professional Formula Wound Irrigation Solution is a next-generation wound irrigation and management solution designed to improve the most essential part of the wound treatment process: preparation of the wound bed. This advanced, pH-balanced solution is used in conjunction with wound irrigation, debridement and dressing procedures, which sets the stage for optimum healing conditions. 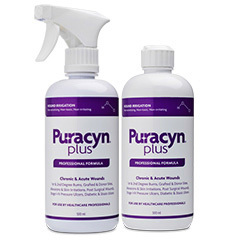 Puracyn Plus Professional Formula Wound Irrigation Solution provides clinicians with a new alternative to commercial cleansers and solutions that may inhibit wound closure. 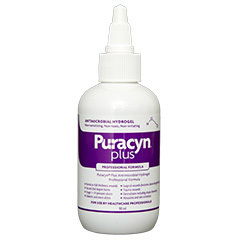 Cleanse and irrigate the wound with Puracyn Plus Professional Formula Wound Irrigation Solution. Saturate a gauze dressing and apply to wound bed. To help reduce wound odor, allow Puracyn Plus Professional Formula Wound Irrigation Solution to soak on the wound bed for 3-5 minutes. Proceed to additional debridement protocols, if necessary. Repeat the cleansing and irrigation of the wound bed. If needed, use appropriate wound filler and cover with dressing. According to the wound etiology, it may be necessary to apply a final dressing that utilizes compression and/or offloading. Puracyn Plus Professional Formula Antimicrobial Hydrogel is designed to add and maintain moisture in the wound bed. A moist wound and skin environment facilitates autolytic debridement and is beneficial to wound management and the wound healing process. Puracyn Plus Professional Formula Antimicrobial Hydrogel has an expansive safety profile, won’t harm healthy tissues, and works in tandem with Puracyn Plus Professional Formula Wound Irrigation Solution to deliver a powerful combination for wound care. For wounds with little or no exudate. Cleanse the wound with Puracyn Plus Professional Formula Wound Irrigation Solution. Shake Puracyn Plus Professional Formula Antimicrobial Hydrogel well before use. With some wounds, a wound filler may be needed to fill the cavity. Cover wound with appropriate wound dressing that holds Puracyn Plus Professional Formula Antimicrobial Hydrogel to the wound bed. Change dressing as ordered or when needed. 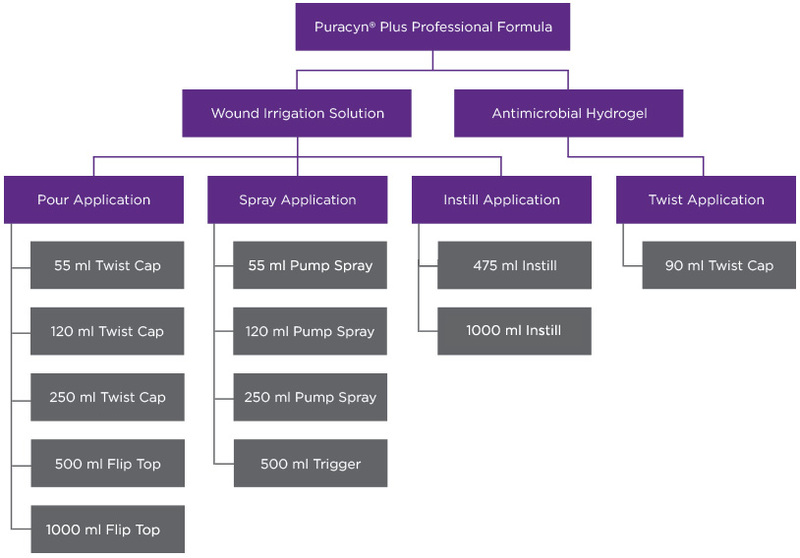 Puracyn Plus Professional Formula Wound Irrigation Solution – Instill Application is a unique solution for adjunctive therapies for wound care. Compatible with ultrasonic debridement and negative pressure wound therapy, Puracyn Plus Professional Formula Wound Irrigation Solution – Instill Application is designed for a synergistic approach to wound bed preparation and management. Puracyn Plus Professional Formula Wound Irrigation Solution – Instill Application assists in irrigation and debridement procedures. By incorporating a hanger system and septum cap that work in tandem with a vented spike irrigation set, Puracyn Plus Professional Formula Wound Irrigation Solution – Instill Application delivers controlled application to affected areas. 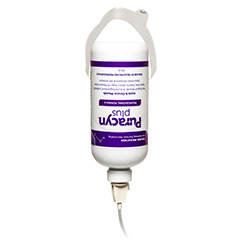 The Puracyn Plus Professional Formula Wound Irrigation Solution – Instill Application bottle must be used with a vented spike irrigation set prior to hanging for application. Compatible with ultrasonic debridement and negative pressure wound therapy. For single use with instillation application only.